It is a tradition to organize a simple or extravagant celebration whenever a married couple is having a baby in their family- this is called a baby shower. With this, their family relatives and friends will buy stuff for their coming baby. 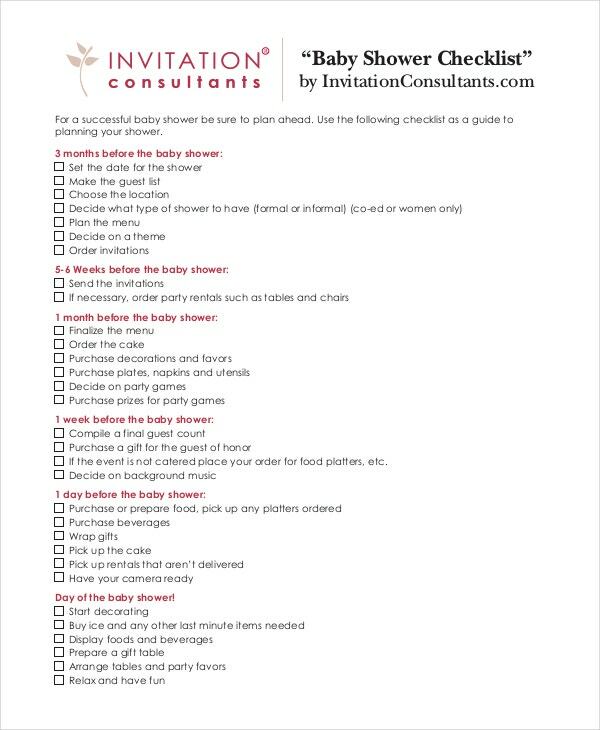 To make this task quick and organize, a baby shower checklist will help them choose the items that both the baby and the mother will need during delivery and after birth onwards. It’s similar to a Baby Shower Gift List where it lists down the things that a baby must have in the first years of his/her life. 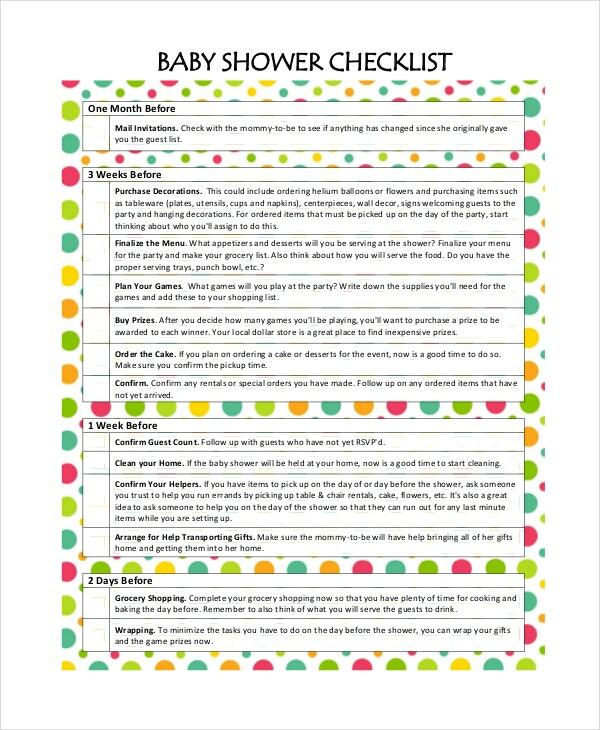 This checklist is accessible in more than 21 baby shower checklists printable templates. Planning a baby shower can be difficult and challenging for couples and using a baby shower planning checklist template can reduce their workload and worries. Budget is also a main concern if you plan to have a baby shower theme before the actual delivery of the baby. This template provides baby shower themes, tips, and plans ready to be used and customize as per your request. This contains a set of listed do’s planned to have each week prior to baby shower celebration. It includes the activities for the baby shower, invitations, registration, exciting maternity gifts and shower gifts for baby. This checklist serves as a guide to make this baby shower event successful. It will be convenient for everyone to use this template for online shopping and selection of items. 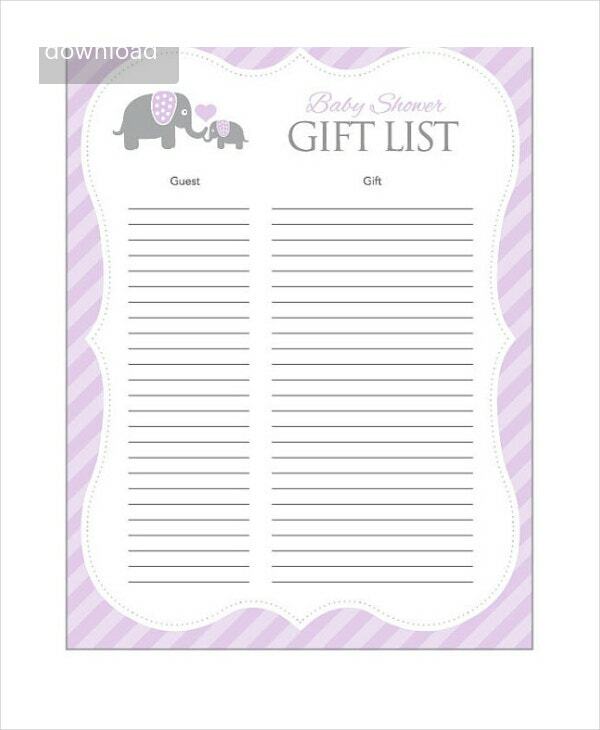 You can also see Baby Shower Guest List Templates. > Who are the Target Audiences for the Baby Shower Checklist? This checklist is intended for parents, newly wed couples, and individuals who want to present gifts for mother and baby care needs and necessities. It is a tool that helps people to plan and arrange the baby shower event without forgetting anything- especially the stuff for the mother and baby on the day of delivery. You can also see Baby Registry Checklist Templates. People who are part of the event may find this useful as they can easily purchase products for gifting the couple and the coming baby. Look at the samples of baby shower checklist on online websites and you will find the right one that is fit for you. 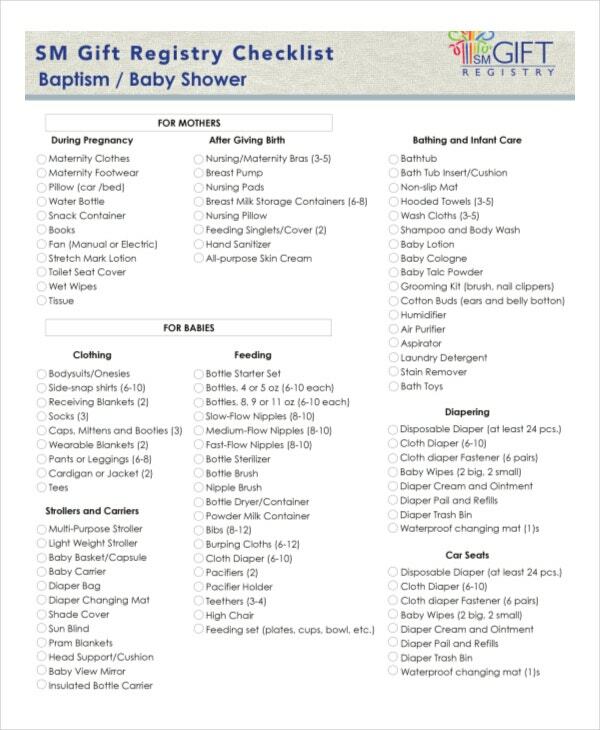 There are hundreds of baby shower checklists ready to be downloaded and printed for free. These checklists are just made for parent’s -especially the first-time parents to check out the stuff for their baby’s needs. You can also see Baby Boy Registry Checklists. This simple baby shower checklist offers a more comprehensive and detailed plans necessary to accomplish the upcoming baby shower event. Weeks are indicated before the day of baby birth and the preparations are listed one by one so as not to miss anything. It will be useful for parents out there to ensure that everything is set for the big event. A baby shower checklist is a kind of checklist that parents must have in preparation for baby birth. It’s a form of a checklist that will remind you of the things needed to be done as the official date of delivery gets near. 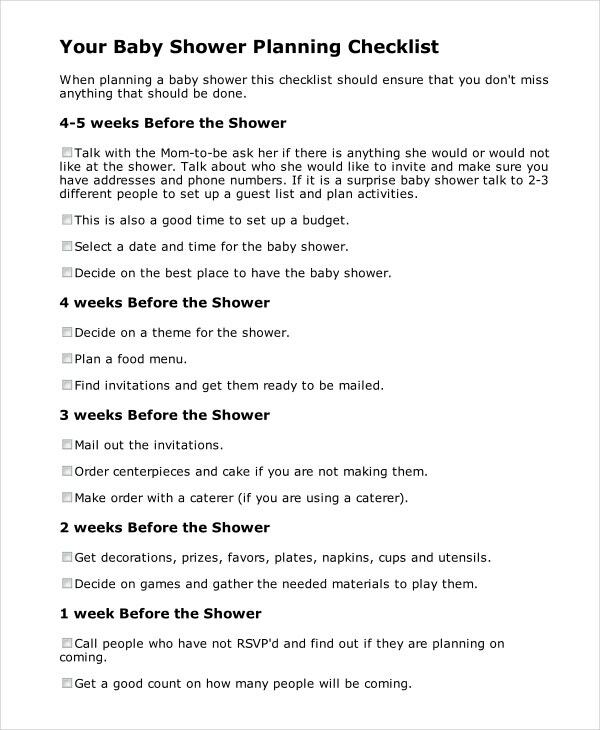 > What are the benefits of using a Baby Shower Checklist Template? First of all, it will show you from the start to the end point the things that a baby should and will need in the course of its development and growth. This will guide parents and individuals in selecting the goods appropriate for the baby’s age and gender without spending their money on unnecessary stuff. They can look at the top branded companies that offer safety products for both the baby and mother with the assistance of baby shower registry checklists and registry template. It can also be used by the different stores to promote the name of their business related to baby and maternity products. All of the premium baby items, activities, and preparations are arranged and listed on our templates to help you ensure that everything is ready before the day of birth. You may also try our baby shower cards to invite your loved ones, relatives, and friends to help you manage your baby shower event. This can add to the sweet memories of the family as they will have a new member, a little angel in their lives. Don’t waste your precious time; download the templates now!